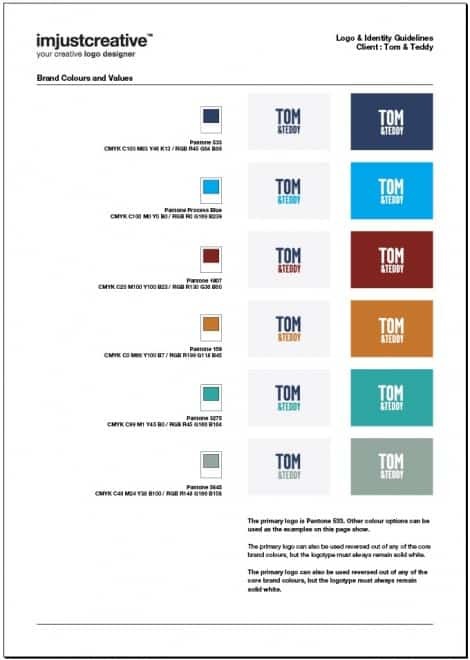 For some time now I have been eager to create a larger version of my Logo Identity Guideline Template For Download which has proven to be a very popular resource. So here is a 4 page template for you to download, change, tweak, destroy and use. This is not the template I was hoping to make available as trying to create a 4-6 page template that is both useable and flexible is actually quite challenging. The reality is that every logo is different; different size, different proportions, different variations, different typefaces and so on. If I had lots of time on my hands then I am sure I could manage to knock out something, but doing one just for the sake of a downloadable resource hasn’t been feasible due to time constraints. In the end I decided to stop stressing over it and decided that the next time a working project came up, that required more than a one page set of guidelines, I would create a version as a downloadable template. I try to keep my identity guides as clean and as simple as possible mostly because I am not being paid to create twenty page detailed whoppers. Even simple guides take forever to put together so more often than not a client just can’t afford the extra costs for a super duper identity guide. This particular guide is a work-in-progress for an existing client so is not yet fully complete. I still think there is enough of a layout here for you to tweak and adjust for your own needs as well as providing a reasonable starting point for your own identity guide. The thought of starting one of these can can leave you quite perplexed as each one will typically need a new approach. Maybe this will give you some inspiration and a little boost to get started. 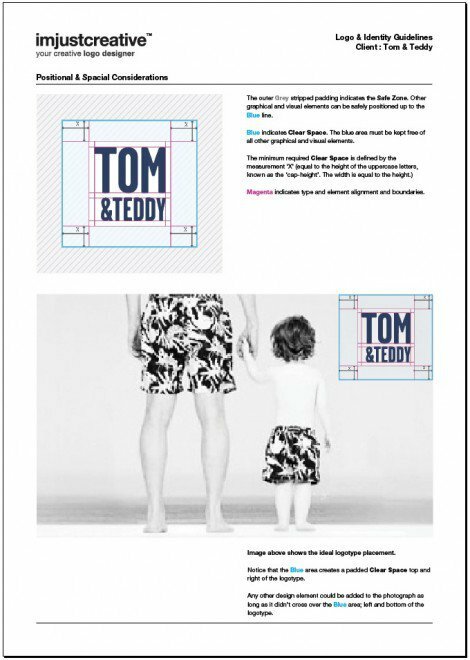 This template includes the same sort of details found in the Logo Identity Guideline Template For Download, but as you will see I have spread the content out over four pages. The finished version of this template could well reach 6-8 pages so please bear this in mind when working out the content for your own guidelines. If you have not yet looked at the original one page version then I would suggest downloading that first as I have bundled in additional files that you may find useful in conjunction with this template download. The ZIP included an InDesign document as well as a PDF, but if you need other versions then please let me know in the comments and I will be happy to oblige. The one issue you may have when opening the InDesign file is to do with fonts. I have used Helvetica Neue for all the body copy and headings so if you don’t have this installed then you will need to replace the fonts. Download Four Page Logo & Identity Guideline Template. This is probably the most important page of the guidlines. A logo can be ruined if careful thought is not given to how it is incorporated in or next to other design elements. Allowing the logo to breathe in its own white space is one of those designery things that not all people would be aware of. By providing a simple diagram of the logo and its clear space avoids the logo being placed too close to other design elements. 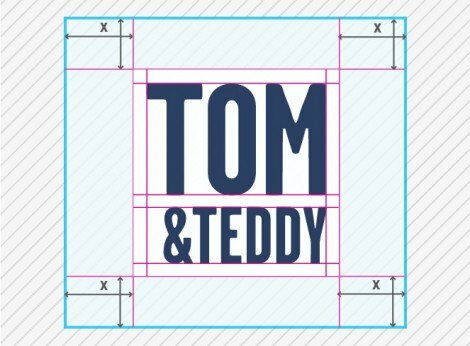 I have also added an example of the logo in place on a photograph where the clear space is working to provide a nice gap to the right and top of the logo. Given the range of colours in this project it made sense to put aside a page which details the acceptable variations of logo colours. I also provided breakdowns of each Pantone colour as the equivalent CMYK and RGB values. The page with the business cards is incomplete as I have yet to design the rest of the stationery, but you can see where I was going with the overall layout. 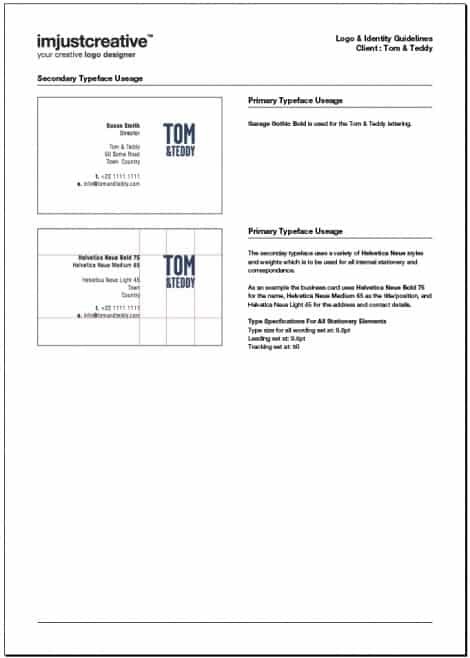 You could have one page for business cards and another for the letter head etc so it really just depends on how many pages you want to roll to. I would rather go to more pages if it means a clearer and well spaced out set of guidelines. Unless you are commercially printing the guidelines then I don’t see any need to be economical with the space. 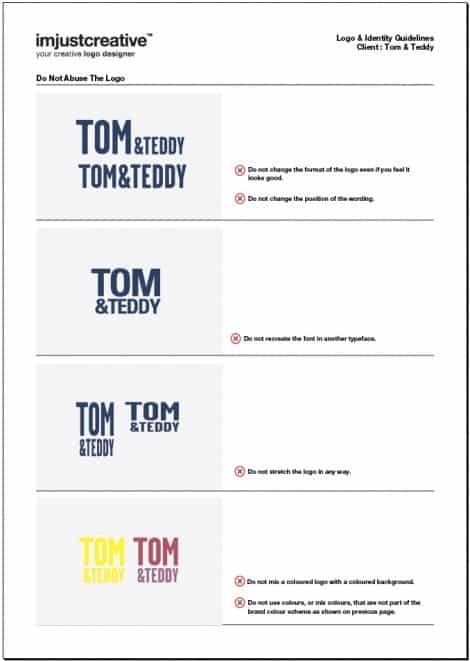 The last page covers the usual methods of abusing the logo design such as: squishing or pulling the logo out of proportion, using the wrong colours, reorganising the layout and recreating the logo with totally different fonts. If you have found this resource useful then I would of course appreciate any Google +1’s and/or FaceBook Likes you can spare. That would make me quite happy. As I said at the beginning this template is somewhat incomplete, but it should still give you some ideas on how to develop your own set of guidelines. When I have complete this client project then I shall update this post with the completed set of guidelines.